Well, I just went and looked at the interior photo's, and that dinette in the galley worries me a little, maybe I am the dumbass after all and it really is a 32ft custom job. I thought they were available as a stock offering in lengths of 28, 30, 33,and 36. Even so, you don't go buying stuff at auction if you don't know what you are doing. I rather doubt this is a 32 ft Breakaway. That is a very interesting point. I wonder how we could determine what it actually is. Has anyone gotten the data tag number? Would that tell us anything? What is a Breakaway, anyway? Is it determined by how we interpret the data tag number? Of course, a sales invoice or brochure would be pretty ironclad. Anybody got a brochure? It's pretty much a given that if it has a 5.9 Cummins in a Spartan chassis, it's a Breakaway. I seem to remember that Lee Merriman has stated on this forum that all Breakaways were of that configuration. And a GM diesel pulling a Pee chassis is a Regal. But what about when we have a mix of those elements, such as the one in question ? And, one member reports owning a Breakaway with a 3116 Cat/Gillig chassis. So far, most have agreed that a Regency is a bigger engine pushing a Gillig or Spartan Mountain Master chassis with a body with a larger roof/wall radius. And, so far, a gas puller is either a Barth (pre MCC) or a Regal (post MCC). Or a Royale. Decals get interesting on at least one coach there, too. Is there a thread here on what is what? Aristotle, Voltaire, et alia, would love to see a bunch of motor home yakkers following their dicta to "define our terms". I suspect the data tag exists, there remains a question about the owners ability of finding it, and then transcribing it accurately. It would handily solve the length and Breakaway status. I thought I read that Lee Merriman had a Breakaway 30 with the Gillig chassis and Cat 6 cyl diesel. I remember because I, like everyone else, want, and need one badly. Sure hope they made more than two. AFAIK, some Regencies had the 6" radius roof transitions, later ones the 12". Breakaways came in 28', 30', and 32/33' flavors, although one gorgeous very late-model 34' was a Breakaway. All were powered with the Cummins 5.9L, except the one Cat Breakaway, and the '94 28', which had the pathetic GM 6.5L TD. Regencies ran from 32' to 40', with a variety of prime movers, including the DD 8.2, Cat 3280, Cummins 8.3; probably a few had the Cat 3116. I recall the Breakaway with the Cat 3116, but I don't know who ended up with it. I wanted it to be me, but I just didn't have room for it. Sometimes I think we're alone in the universe, and sometimes I think we're not. I think the Cat engined Breakaway ended up in Vancouver. This one on ebay is certainly not a 33 and I didn't know Barth made a 32ft Breakaway so I thought it must be a 30 ft. I asked the seller a question about the data tag but I am not really expecting an answer. Nick Cagle is doing a great job entering the data tag info into his spreadsheet and after he gets a larger number of Barths on record his work will go a long way to solving some of these mysteries. Good luck on a response from that seller...IMHO, he'll be reincarnated as mildew. I think he is already mildew.......it is just in the form of a car salesman. Rusty: it looks like it may have the 6.5 DT similar to your experience, in a somewhat longer coach. It is odd that NADA does not list a 95 Breakaway. It also does not list a 95 Regency 32ft under 250 hp --- did they up the hp in later years? Neither the NADA nor the Kelley is always complete or accurate. Particularly with a low production outfit like Barth. And, of course, Barth built a lot of one of a kind units. I have emailed the seller a couple of times and asked for the data tag without response. Maybe we have a member in the area that could look at the coach and get it for us. Your right, it would sure solve a lot of the mystery. First question is, where is it today? I had a heck of a time pinning him down last time I tried to look at it. It was reported to be either in Utah or Orange County, but was finally positively admitted to be in a secret location in Fontana (Los Angeles or San bernardino County), accessible only to dealers. Oh well, three counties and two states, what the heck. Getting an answer from that guy was like herding cats. I was gonna look it over then, but the seller didn't answer my e mail until well past the day that I was out that way. Jerry Malvern drove it when it was in Fontana. He got the GVW from the data tag. Maybe he has some numbers. This is also the one with the GM 6.5L TD...not enough engine for this coach, IMHO. Sorry, I did not get the tag numbers. 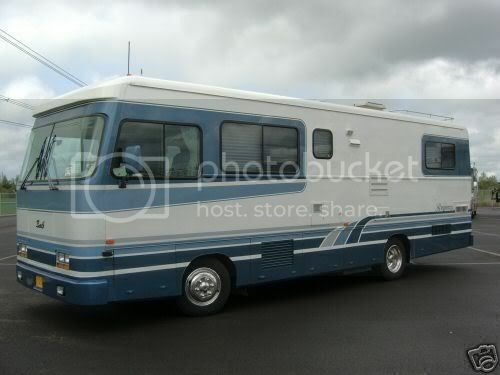 Here's what I know about the coach and the sellers....it's very clean and drove nicely but it has the 6.5 engine. As far as the sellers, the son seemed very nice and was willing to answer all my questions. They are headquartered in Utah and he (the son) runs all over the countryside picking up the coachs they buy and then resell on ebay. The coach was never in Orange County, but in Fontana Calif, which is in San Bernardino County. They put it in the Manheim Auction in an attempt to sell it, as they are major up-side down in the coach, they know they will lose a bunch on this deal. If you have access to or can replace the engine when the time comes, and are looking for a really nice coach on a budget, here it is. 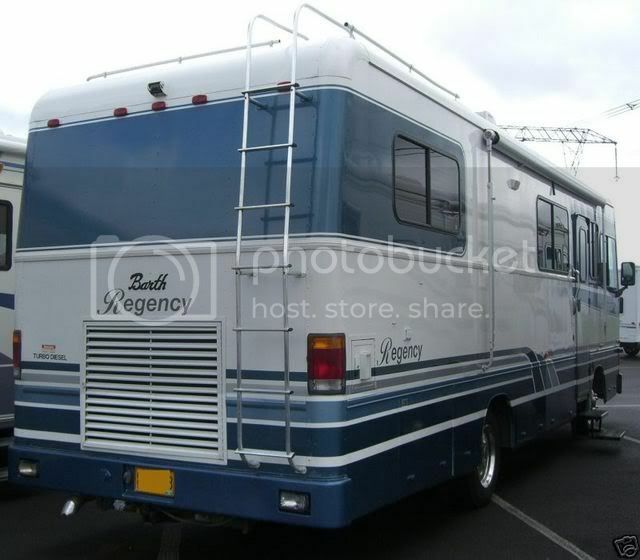 If you look at this coach as an "RV" and not a "motorhome", the value becomes apparent. Well believe it or not here is the Data tag on this coach. 9409-3934-30LK-19B. Every tag we have gathered so far would say this is a 30 foot coach. Well, this is proof that mildew responds to stimulus. In fairness his status should be upgraded at least to that of a lichen.